So I’ve been playing Borderlands at night before going to bed, but now I’ve expanded to playing in the morning before work. I think I’m right at the end of the game, but who knows… it could just go on forever. Eventually though, the solo-fun will run out, and that’s where things get interesting. I usually detest the “run and gun” multiplayer modes most games have. Trying to play a decent game of Halo with friends ends up being a big mess, with no actual strategy… or fun for that matter. This is why Borderlands is different. Borderlands features drop-in/drop-out co-operative play for up to four players. So what happens when your friend wants to join your game but is at a much higher level than you? 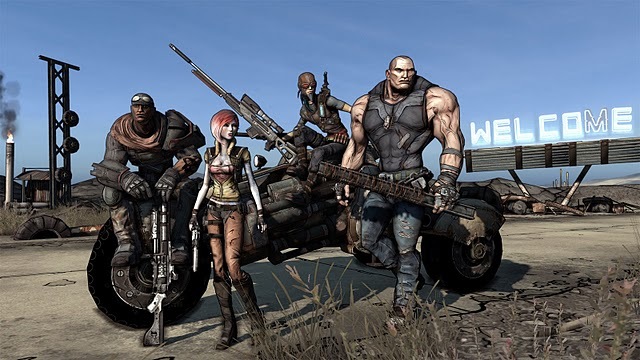 How does Gearbox balance the experience? “You don’t!” says Gearbox president Randy Pitchford. It’s refreshing to see a developer placing trust in his game’s community to make the right choices to find the type of experience they want. This entry was posted on Friday, February 12th, 2010 at 8:22 am	and is filed under Life in general, Reviews. You can follow any responses to this entry through the RSS 2.0 feed. You can leave a response, or trackback from your own site.